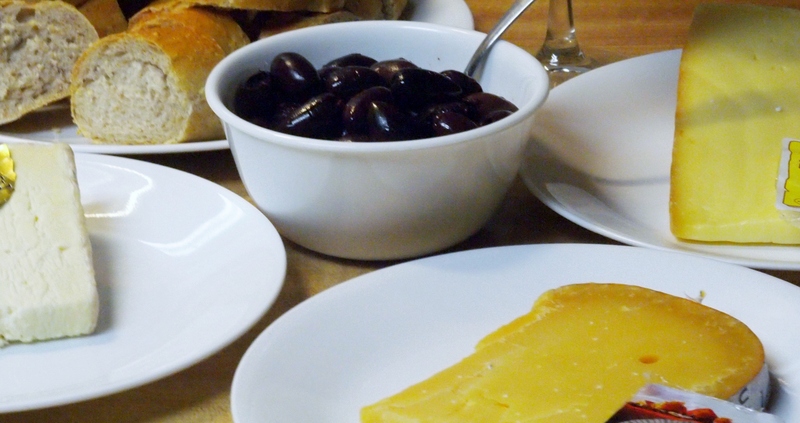 The ideal way to start the new year is with good olives, good wine, crusty bread and fantastic cheeses. We’ve talked in the past about our need to grow, to change, to become happier people, to have broader minds, to be deeper thinkers: In short, to be a better person. While I don’t have a lot of goals for 2013 (Never, EVER call them resolutions), I do have three. First, I want to write every day. Someday, I want to sit in an Italian coffee shop and write my fourth book, like my friend Gina. But to get there, unlike Gina, I will need practice, practice and more practice. I will probably need an editor and a ghost writer but that’s another year’s goal. In the mean time, I will write for this blog, my study blog, my prayer blog, and competitions. I’m burning up the morning hours with fingers flying! Second, I want to read. I want to read a lot. See Curt read? Reading is fun. Last year I knocked off a couple dozen books and that was after starting in earnest in June. This year, I believe I can finish nearly 50. Between audio books and reading actual pages, I have a real shot at this. I’ll consume books about history and art, biographies and novels. I will learn about diseases of the body and the healing of the soul. That’s not a bad way to spend a year. Finally, I want to experience Cheese. I want to eat 100 kinds of cheese in the coming year. I want to get the best options in my mouth and compare them, savor them and learn about them. I want to know where they are made, their ingredients, their strengths and weaknesses. I want to know what wine goes with which cheese. I want to experience the wonder that is milk turned into solid form. So, that’s it. Those are my big three. Write, Read, and Eat. Hey, I guy can dream. Can’t he?